January 31, 2018, Reston, Virginia – Dairy farmers Brian and Rachel Detwiler of Altoona, Pennsylvania were recently named the 2018 Outstanding Young Cooperators (YC) for Maryland & Virginia Milk Producers Cooperative. As Outstanding YCs, the Detwilers are invited to attend co-op board meetings, plus attend events hosted by the National Milk Producers Federation in Washington, D.C. and Phoenix, Arizona. Brian and Rachel have been farming in partnership with Rachel’s parents, Joe and Veve McCutcheon, at Maple Kroft Farm since 2004. They milk 200 cows, raise 140 replacements and farm 180 acres. Brian and Rachel are blessed to have four sons, A.J. (13), Aiden (10), Andrew (8), and Abram (5), and to raise them in a multi-generational family farm environment. Every year the Detwilers strive to connect with their local community, and show how dairy farmers work to provide a wholesome product. “We have church picnics at our farm and invite our sons’ football teams out for hayrides,” said Rachel. And every fall they open their farm gates to host 75 three-year-old preschoolers for a tour. “Once you start opening your farm to the public, you end up building good relationships with non-ag people,” she said. “I’ve realized visitors are really excited about the farm and want to come back again, especially the kids,” Rachel added. On the farm, Brian wears many hats; he’s the herd manager, crop manager and employee manager, plus he milks and feeds cows. Rachel also milks and she handles the office side of the farm enterprise from payroll and taxes to accounting and banking. The Detwilers are also active in the Blair County and Pennsylvania Farm Bureau and the Grace Baptist Church of Tyrone. “We look forward to sharing more of our story as Maryland & Virginia’s Outstanding Young Cooperators over the next year,” said Rachel. Maryland & Virginia selects an Outstanding Young Cooperator couple or individual to represent the organization at national industry events. The winners are chosen based on their dairy and community involvement, ability to communicate with others, and their dairy knowledge. For more information about the Young Cooperator program, visit the Maryland & Virginia website at www.mdvamilk.com. Maryland & Virginia Milk Producers Cooperative is a community of dairy farm families passionate about cultivating dairy goodness. Founded in 1920, the cooperative’s farmers produce more than three billion pounds of milk a year for consumers and manufacturers worldwide. Our dairy farm families take pride in creating dairy products people crave, operating with passion and integrity, responsibly caring for our resources and providing a rewarding livelihood for our farmers and employees. 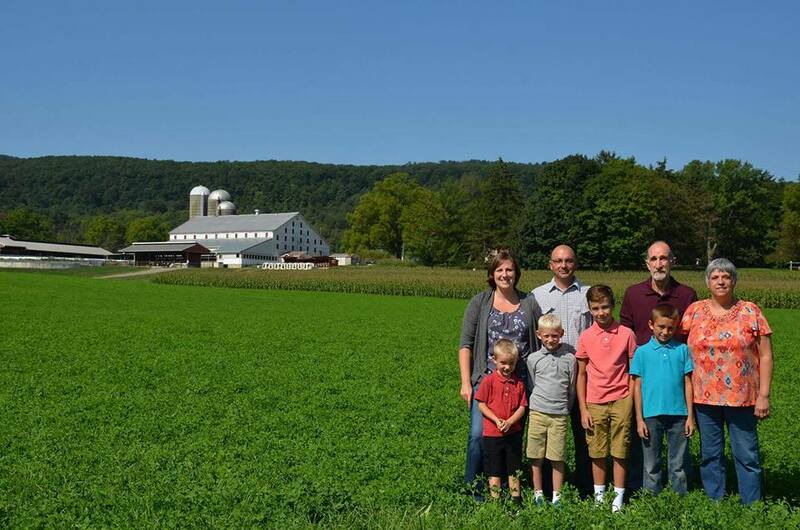 Rachel and Brian Detwiler and family – Newly named Outstanding Young Cooperators, Brian and Rachel Detwiler (back row, left) farm with their four sons and Rachel’s parents, Joe and Veve McCutcheon in Altoona, Pennsylvania. (l-r) Back row: Rachel and Brian Detwiler, Joe and Veve McCutcheon; Front row: Abram, Andrew, Aiden and A.J.